This is a guest post by Jonah Campbell, who writes still crapulent one of only two food blogs that I follow (the other being Edible Geography). He’s also got an unofficial post up, on what he would have written about if he’d written about cyborgs and food. The Terminator is not a cyborg. Rather, I am not comfortable with the idea of the Terminator as a cyborg. And before we get all into why, let’s be specific: I’m not talking about “The” Terminator, because even though that’s what the movie is called, it’s really just referring to one unit of a whole class/army of killer robots, so I may at times use the generic “a Terminator” or plural “Terminators”. Don’t get confused. The original, classic Schwarzenegger Terminator is a T-800, and it is really the only Terminator for which the cyborg discussion is even relevant, because it is the only Terminator to involve a machine/organic interface (the T-1000 is just a machine that can mimic the flesh, without actually having or being the flesh**). The nature and substance of this interface is a pivotal component of our understanding of the cyborg. Here it probably becomes clear that I am using “cyborg” in something close to the popular usage of the term (man/machine), rather than the expanded theoretical/metaphorical fashion which I believe is also valid, although similarly problematic in the case of the Terminator. We can come back to that. This question of the nature of the interface is a practical, as well as conceptual, consideration. 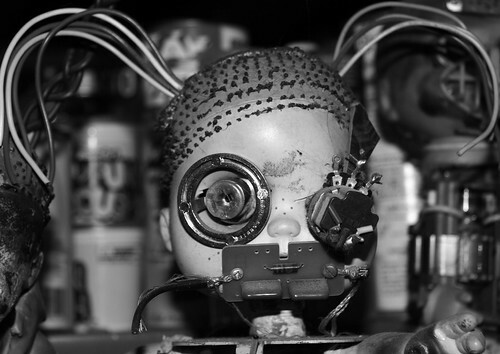 What -is- the relationship between the robotic endoskeleton and its fleshy exterior? What is that flesh? We are given to understand that it is alive, in some way, because there is some property of organic matter (“a field generated by a living organism,” apparently) conducive to time travel that is absent in naked synthetic material, but is it kept alive by the machine? Does the machine have any interest in keeping it alive, outside of the practical considerations of time travel and camouflage? From the film’s evidence, it doesn’t seem to bleed much, so it probably is not being maintained by the same mechanisms as human flesh, and we don’t really get much sense that it bears more than a modest superficial relationship to actual flesh, because despite the immensity of Arnold Schwarzenegger the man, the power comes from the endoskeleton, therefore the heaps of rippling muscle are little more than window-dressing – assuming there’s muscle in there at all, as opposed to just layers of some foamy vat-grown organic tissue. Further indication that it’s not really maintained by any feedback relationship with the endoskeleton is that it doesn’t seem to heal. So what does it do besides provide useful covering for an otherwise autonomous metal frame? What does it do to or with the robot? And to the extent that the answer is “nothing”, then in what way is it different from a suit of armour worn by a human fleshbag, who is by most accounts exempt from retroactive induction into the cyborg pantheon? Is the flesh for the Terminator just clothing, just camouflage? And if so, does that a cyborg make? Similarly, say you needed to send a gun back through a time machine (this was the sticking point we as kids could never quite resolve when thinking through the practical logic of the film***), couldn’t you just cover it with flesh? Hide it in, like, a severed arm or something? And if you did so, would that qualify as a cyborg? It’s just a weapon covered in fleshy matter, so it seems somehow to be missing something. But then, what is a Terminator but a weapon covered in flesh? How different is this from, oh I don’t know, a hammer with a human fist attached to it? What this gets at, the sort of inadequacy of the flesh+metal equation, is the unspoken role of agency in the ontology of the cyborg. Perhaps agency is too strong a word, but there is the sense that – more than just mildly animate matter – there should be some sort of being, perhaps a living being involved in the cyborg equation. It is not enough for there to be a cobbling-together of animal and machine parts, there needs to be some sort of animus, and why? Because it’s not interesting otherwise. Now I’m not necessarily saying that it needs to be a human. I’m open to aliens and cats and whatever being cyborgs, but even that openness betrays a certain prejudice which I will defend for conceptual – if not personal – reasons. That is a prejudice in favour the living, or at the very least, an insistence on the specificity of the biological in its relationship to the cyborg. Which is why the Terminator is not a cyborg to me – it’s a robot in a suit. It’s a man in a coat. Part of why I think cyborgs are interesting, why they are interesting to us, culturally, is how they play on our anxieties about the human, and about the unity/disruption of the human body. The biggest question on the mind of every cyborg and every person who is afraid of cyborgs is “how many augmentations before they’re no longer human?” How does that happen? How does one cease to be human? It seems an odd question, but it rears up, it insists upon itself because the state of being a cyborg is inevitably interpreted as a process of ceasing to be human (Ghost In The Shell and its spinoff Ghost In The Shell: StandAlone Complex do a wonderful job of exploring just these type of questions, and rather than summarize I suggest you just read and watch them). Now obviously the Terminator plays on some cultural anxieties (I mean it’s a robot skeleton, right? ), but I don’t think these are the same anxieties, the same tensions. The Terminator comes from a long line of Creations Gone Awry/Don’t Play God/By Our Hubris Undone/Science Run Amok sort of tropes, of which killer robots are merely one strand. In their unstoppable robotic march we manifest our fear of being replaced by our technological creations, but there is something much more insidious about being…invaded by our technology, being compromised in our fundamental organicism. 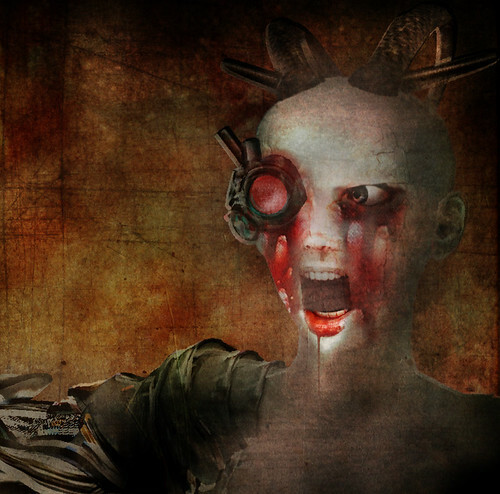 The cyborg, in its more dystopian moments, is an icon of body horror. Of course it is altogether different things in different lights – it is progress, it is the advent of the posthuman, it is testament to our capacity for adaptation, for expressing our mastery over or indifference to both Nature with a capital N and nature with a lower-case one (there is also, very much tied-up-in but in many ways distinct-from the cyborg as trope, a whole world of interesting and cutting-edge thought about prosthetics coming not from the tech world but from radical disability theory). It is also the ambiguous gift of cyborg arms that can lift 20 tonnes attached to a skeleton that comes apart like a wet wicker basket under 2. This is less about drawing lines for the sake of categorical hair-splitting than it is my belief that we are better served by a notion of the cyborg that does not contain, or at least is not comfortable with the inclusion of the Terminator. And I am all for pushing the limits, exploring the contours of a given idea, such as using the cyborg as a conceptual tool to reexamine humanity’s historical, social, and material relationships to technology, but I am at the same time into the cyborg as an object and as a category that does not subsume all as grist to its mill. 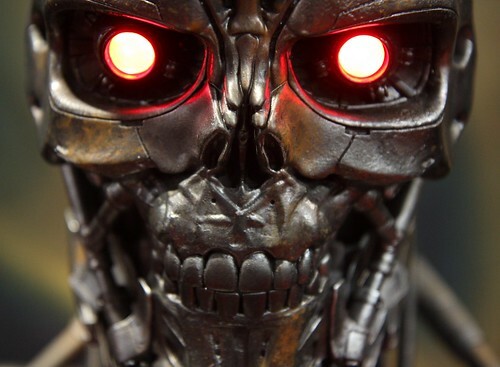 The question here is to ask is what does ‘the cyborg’ tell us about the Terminator (or allow the Terminator to tell us about ourselves) that the ‘killer robot’ does not? Because Robocop is not just a man in a suit. * because I know right in the movie they say the Terminator’s a cyborg, but frankly I’m not convinced. Not by James Cameron, not by a long shot. ** okay, actually, after all this, the only Terminator that would really qualify as a cyborg is the one from Terminator: Salvation, but that movie was totally stupid and I’d rather not talk about it.